Many of you may be wondering why I don’t do too many reviews. The truth is, I am very conservative as to the music that I purchase, and often don’t get to listen to many disks until they’ve been out for quite a while. So it’s quite likely that others have reviewed them, and my review would be superfluous. In addition, as a Modzitzer Chassid, I’m not going to pass judgment on my Rebbe’s niggunim, although I do try to alert my readers when new recordings are available [more about that soon!]. That said, I was very excited and pleased to see and hear the new recording issued by "Shirei Shmuel," MO Chassid’s org. established in memory of his late father Shmuel z"l. I am speaking about "K'Shoshana," which contains ten [actually 9, see below] relatively rare niggunim of Reb Shlomo Carlebach zt"l, sung by Shlomo Katz, Aaron Razel and Chaim Dovid Saracik. As one of the few people in the J-Blogosphere who has heard these tunes sung by Reb Shlomo, I feel the need and importance to present this review. [I actually wrote most of this around 2 weeks ago, but Chanuka and other things have delayed its posting]. However, some words of introduction are necessary. As a prolific composer, when making a new recording, Reb Shlomo would go into the studio "armed" with some forty or fifty (!) niggunim, from which twelve were chosen. The remainder went "underground," so-to-speak, unless they somehow made it onto a subsequent recording. However, by then he would have another forty or fifty tunes, so you can see that over the years, the "unrecorded masterpieces" really outnumbered those officially recorded. Fortunately for us, Reb Shlomo lived in an era when there were tape recorders – first the large reel-to-reel kind, and then later, cassettes. So, since Reb Shlomo would compose niggunim at every opportunity, at private houses and at remote places in the world, hundreds of niggunim were preserved only because somebody recorded them on a tape recorder. 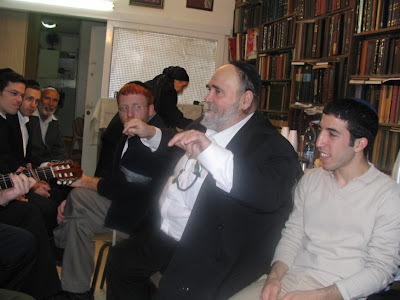 Itzik Aisenstadt leading a Carlebach "zitz"
And here special mention must be made of my good friend Itzik Aisenstadt, who met Reb Shlomo in 1956 (! ), and was in constant contact with him from then on. [Reb Shlomo’s first record was released in 1959.] He has been called 'Keeper of the Treasury of R. Shlomo’s Niggunim' by none other than Ben-Zion Solomon, himself a fine musician who has recorded many of Reb Shlomo’s niggunim, as well as his Nusach for Shabbos davening. Without 'Itzikel,' who knows how many of these niggunim would have been preserved? That being the case, we have the following scenario, whose numbers are approximate. In his lifetime, Reb Shlomo recorded 'officially' some 250-300 niggunim, in the albums released over a 35-year period. Even here, however, some of the earlier albums have gone out of circulation, and have yet to be reissued, so there are several tunes that many don’t know, even if they’ve been once recorded. The reasonable approximations are that there are some 400 additional niggunim that he composed, that are to be found on these private tape recordings. There are people out there who collect these various niggunim, basically by hunting down those who may have been there at the time, and then trading with each other. But of course, the quality of these recordings starts at mediocre, and when you then pass it along from friend to friend, the quality becomes that much poorer, until the song is barely audible. * Shlomo B’Ahava, Vols. 1  and 2  – a compendium of “unrecorded masterpieces,” sung by Reb Shlomo himself. However, these are again from the private tapes and are of sub-standard quality. However, the niggunim themselves are mostly excellent, including 16 with words, and about a dozen wordless niggunim. (There are also some mistakes here – niggunim of others attributed to Reb Shlomo). * Give Me Harmony, Ben Zion Solomon & Sons . 9 previously unrecorded niggunim. See also here. * Higher & Higher, Shmuel Zivan . 3 previously unrecorded niggunim. * The Hidden Songs of Shlomo Carlebach, Yisroel Travis . 7 previously unrecorded niggunim. * Nevertheless…[Uv’chal Zos], Aaron Razel & the Witt Children . 11 previously unrecorded niggunim. * Unplugged, Eitan Katz . 4 previously unrecorded niggunim. It should be noted that there is some overlapping in these recordings, especially between "Shlomo b’Ahava" and "Nevertheless," from where 7 of the 11 songs were taken. Okay, now it’s time to get to this new disk, "K'Shoshana." I must say that I was both excited and apprehensive when I heard about the making of this album. Excited, because Shlomo Katz, Chaim David, and Aaron Razel are some of the top singers of Reb Shlomo’s music today; and also because niggunim like the title track, "K’Shoshana," are so very special, and it would be great if the public at large gets to hear them on a good-sounding studio recording. My apprehension was also twofold: one, because Shlomo and Aaron have sweet, delicate voices, while Chaim Dovid’s is soulful and somewhat raspy, and I wasn’t sure they’d mix. But more so, because [in my opinion] Aaron Razel’s previous attempt at Reb Shlomo’s music, the above-mentioned "Nevertheless," did not really do justice to many of the niggunim recorded thereon. Suffice it to say that I call it, "Carlebach light." So let me say from the outset that this is a fine album. The choice of tunes, the singing, the musical arrangements [with one exception, which I’ll get to] are quite good. Moreover, they basically present a faithful rendition of Reb Shlomo’s tunes, and while their own individual singing styles are present, the Carlebach quality of the niggunim comes through. Interestingly, the singers do much of their singing as solos; but when they do sing together, they harmonize well. Ravrevin: Avi Singolda’s guitar intro is tasteful and unobtrusive. The tune is nice, bouncy, and quite different from Reb Shlomo’s other Ravrevin found on the Yisrael B’tach BaShem recording. The guitar and saxophone interludes between the singers is also tastefully done. You can see them sing Ravrevin on YouTube. Borei Olam: Composed for R. Shlomo’s own Sheva Brachos in 1972, it is a happy and even somewhat majestic tune. Again, the sax and guitar work are nice, and the singing is fine. You can see Borei Olam on YouTube here, or listen to it: click to listen to the song Boreh Olam (courtesy of Arutz 7). Tzur Yisrael: This was previously sung on Shmuel Zivan’s "Higher & Higher" recording [see above], whose version I like better. Chaim David sounds a bit strained at first, but gets better as he goes along. Methinks this one is sung a bit too fast. The tune is a nice one, and Reb Shlomo also sang it to Odcha in Hallel. K’Shoshana: the title tune is indeed a beautiful one, one of Reb Shlomo’s best! Shlomo Katz has a very sensitive feel to this dveykus-style niggun, but its greatness is evident in that all three singers sound really great. In addition, the strings, Razel’s piano interlude, as well as Nati Amrani’s oboe add a lot to this fine tune. For this song alone, it is worth buying this CD. All three do K’Shoshana on this YouTube link. You can also watch Shlomo Katz singing K’Shoshana, over a year ago in Melbourne at this link. V’Havienu: I’m sorry to say, this one they got wrong. Wrong tempo, wrong musical accompaniment… it’s overdone, overproduced, over-"Razellized". Anyone who’s heard the original will know what I mean, and probably agree with me. Especially disturbing was the "cheerleader" section [with the Nachlaot children] at the end, which has nothing to do with the tune. However, this is the only song I don’t like. You can see V’Havienu done on YouTube as well. Kol Mevaser: words are from the end of Hoshana Rabba davening. This upbeat tune is very well done, including the somewhat difficult "chazanus" part at the beginning. This time, the tempo is right on! Once again, Nati Amrani’s oboe is quite charming. Ki Lekach Tov: Written in Israel in 1963. (On my personal recording, you can hear Itzik Aisenstadt’s voice as much as Reb Shlomo’s!) Razel’s arrangement of the intro and the interlude, with some jazz-like flute playing by Yoni Dror, is quite nice. The alternation of the singers’ voices here is well done. The tune is another upbeat one. Shuvi Nafshi: Another upbeat tune, radically different from the slow, ¾-time rendition of these words found on the "Best of" R. Shlomo recording. Razel’s piano intro is nice, as well as the responsive singing. Chaim David does a good job here. L’Dor vaDor: A somewhat difficult tune to sing, with an opening "chazanus" part, but the singers handle it beautifully! Their harmonies are really beautiful, reminding me of the Ben-Zion Solomon & Sons recording of "Give Me Harmony." The song is a slow, soulful one, and they do it right. [Reb Shlomo had other tunes to these words]. A Hidden Niggun for Yidden: Turn up the volume if you want to catch a very cute Q & A between Aaron Razel and the other two singers. I must admit, I was not familiar this tune – but I "melted" inside when I first heard it. Why? Well, close your eyes when you listen to it, and the tune might just carry you away! Chaim David’s singing here gives the tune an almost Irish/Scottish flavor. And the harmonies of all three are truly beautiful. [I have only one, ahem, minor problem with this. I found out recently, from a very reliable source, that this tune is not Reb Shlomo’s. More in the comments]. Again, despite my reservations about "V’Havienu," I find this a very good disk, great to listen to, and wonderful to hear Reb Shlomo’s niggunim going onwards to the next generation of singers. Do indeed check it out, and if you like either Carlebach niggunim, or any of these performers, you’ll find it’s a must-buy! Yaasher Koach to MoChassid and to Shlomo Katz, Aaron Razel and Chaim Dovid Saracik, for a job well done!